We have sold the Discovery at last – to a very nice English couple. I had advertised it on line, with very little response. I then tried a French website / publication something like Exchange and Mart used to be. Got the buyer from that, but also opened us up to a number of attempted scams. The best (worst) was definitely the e mail from the prospective buyer who wanted to but the car sight unseen for his father. He couldn’t view it himself as he is an oceanographer and at sea. He can’t speak to me because he is deaf. We can arrange payment through PayPal. No. I quickly responded to every reply by answering that I would only sell to someone who came to our house, and produced an ID and proof of where they lived. Well, at least the car’s gone. The Alfa is superb by the way. Had a trip to Tulle, the Departmental capital a couple of weeks ago. We have never really warmed to the place, possibly put off by an friend who ran a hotel, and said they hated going there as it was the place you went to to pay your taxes. It is set in a valley, which gives it rather a claustrophobic feel. We gave it another chance, and we still don’t like it. 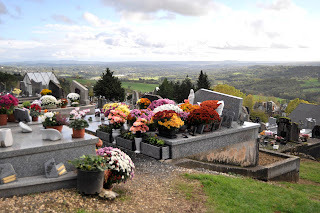 We much prefer going to Brive – our favourite café near the large church in the centre has a new attraction. The area outside where we used to sit is now an archaeological site. 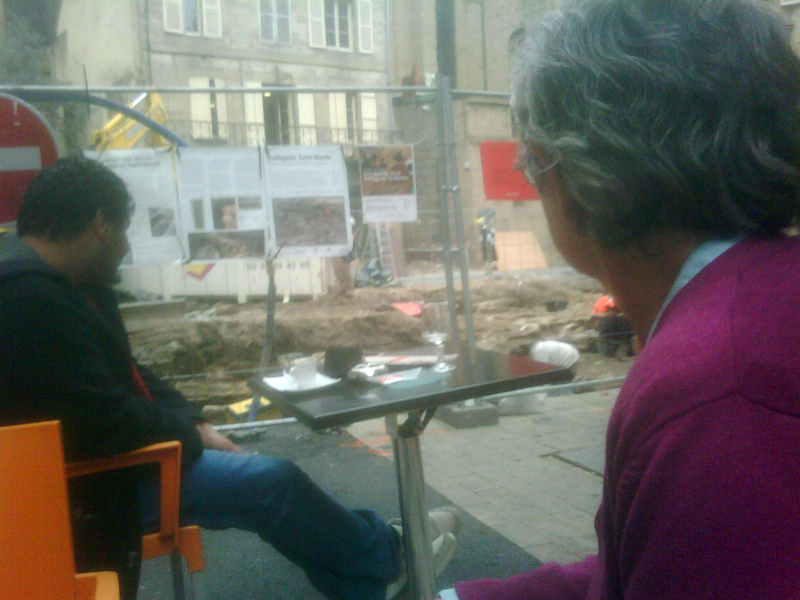 They are pedestrianizing the area around the church, and as part of the work they have uncovered a graveyard under the café terrace. Hot chocolate and Time Team – excellent! The weather has been reasonable – obviously it’s getting colder but we have had a few lovely days. Autumn seemed to last about 10 days – as soon as the trees started to turn in colour a storm took most of the leaves off. 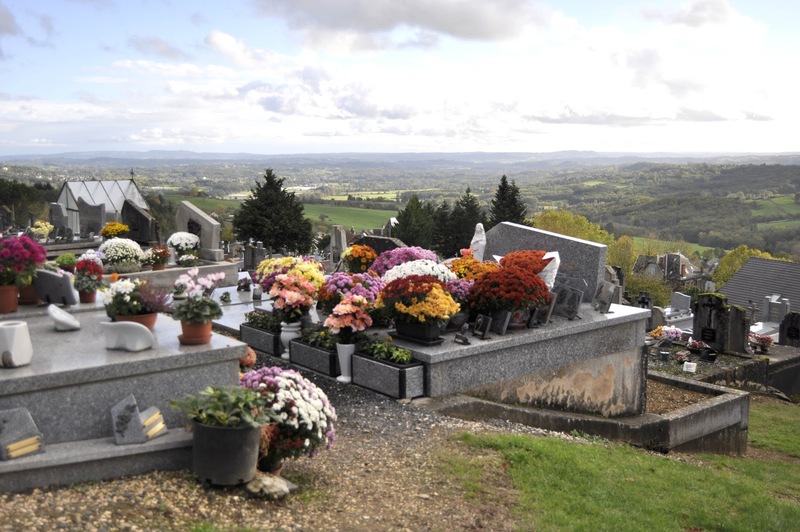 The 1st of November is Toussaint (All Saints Day) when the French try to visit their family’s graves and leave flowers – normally chrysanthemums. Round here it is pretty important and the cemeteries are full of lovely colours. If a public holiday falls on a Sunday, then that’s too bad (as Remembrance Day did this year). If it falls on a Thursday or Tuesday, then many people “Faire le Pont” – make a bridge and take the Friday or Monday off as well. Like it! Talking of Remembrance Day we attended the small ceremony held at the war memorial outside the church in the village. Judy and I wore poppies which we were able to get for the first time this year. We were invited to join everyone for a small Apero (drink and nibble) in the Mairie afterwards, so I think we are becoming a little more accepted all the time. The library is ticking over nicely. We have over 60 members and some 2,000 books, plus a load of duplicates. To raise a little money I organised a Pub Quiz at a small café/bar run by and English couple nearby. It seemed to go OK – and the team from the library won, so all the entry money went to our funds. We had a nice meal too! I have had a few jobs to do drawing up floorplans and taking photos. The biggest job was an old stable complex which seems to be owned by the National Stud based in the local town of Pompadour. It was a very strange place – a house split into three parts and – not surprisingly, lots of barns and stables. I then drove down to the Dordogne to photograph some gites – the weather forecast had said we would have a nice sunny day, but it was pouring with rain when I got there. The dull weather and lack of leaves on the trees made for a somewhat muted photo collection. My last job was in the beautiful village of Domme – again in the Dordogne. Someone who had just bought a house there wanted a plan to enable him to work out what he might do with the place. Some very old friends, the Makepeaces (well Dave is the very slightly older than me, so that’s pretty old) have bought a holiday place near us – they stayed for a few days while they signed the final papers. It’s a very nice little cottage just over the border in the Dordogne. A bit of work to be done, but it will make a smashing retreat for them and their family. Judy has got the wood burning oven in our dining room working well, so I have been chopping wood for it – the remains of our walnut tree we had to have felled earlier this year. Sadly the other wood burner in my study appears to be past it, and putting a flue up the chimney could cost about €700 – so it is now a plant pot holder. We were hoping to see Skyfall the new Bond film in V.O. – version originale i.e. English, but it wasn’t shown locally. Luckily our friend Diane, who lives near Sarlat in the Dordogne (about an hour away), called us to say it was on there for one performance. We went together and thoroughly enjoyed it – and supper with Diane afterwards. There are usually a few V.O. films showing every week in Brive – just rarely any we want to see. Just to show how much I love the Alfa it’s been washed twice since I bought it – which is about the same number of times we washed the Discovery in all its long and serviceable years. Yesterday we took it out for a nice run to the Chateau village of Hautfort, about 40 minutes away. Lovely day and very pretty village. Sadly nothing open as the Chateau and a museum of medicine shut for the winter on the 11th of November. This is actually much later than the average – many attractions don’t even open at Easter and are only open for the summer. In a neighbouring, very pretty, small village is a café which opens on the first day of July and shuts on the last day of August. 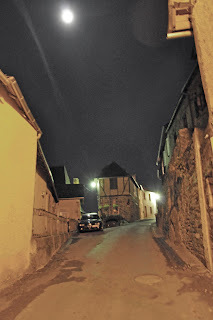 Anyway, night, night from the bustle of Voutezac!